While checking out the Ritz Facebook page earlier this week for information about when Tony’s video chat would be, I happened upon a comment posted to their page about Tony Stewart’s Helmet Toss at Bristol last Saturday. This particular commenter was upset about the Helmet Toss, the lack of penalties levied and commented that they were going to stop buying Ritz because they sponsor Tony Stewart and they were going to encourage all their friends to do the same. I had seen some similar comments made about the already infamous helmet toss on other social media sites so it didn’t surprise me really. As a Tony Stewart fan my first instinct is to classify these kind of comments as coming from “haters” and carry on with myself. After being a Tony Stewart fan for AGES, it’s not like I haven’t been exposed to the “haters” before. I decided long ago that probably every driver has “haters” and it’s just par for the course…and best not to “poke the trolls” as I like to say because often that is what they want. While of COURSE we don’t want children running around throwing things when they are angry- I do not think that Tony Stewart’s actions on Saturday automatically disqualify him immediately from “role model” status. And he MOST DEFINITELY should not be fined, have points removed or have sponsorship dollars taken away. Matt and Tony were racing for the LEAD of the race when the incident happened that caused them both to crash. Is Tony Stewart (or Matt Kenseth for that matter) suppose to get out of the car and say “Oh shucks well I guess that kind of thing happens! On to the next race!” That reaction to the situation is wrong on so many levels. First off, it indicates that it is not OK to be angry when something that you have been working hard for gets ruined and pisses you off (and yes Tony worked hard to get that position because earlier in the race Tony was a lap down). Also, to me anyway, just saying OH WELL, kind of indicates that you are giving up. Oh well. Shucky darn. Maybe next time. Yeah, I don’t think so. Not mention that drivers that give the “Well it was just a racing thing that happened” line tend to be called vanilla and then despised for being too corporate, to plain, not enough personality, that kind of thing. Well NASCAR fans, you can’t have it both ways. I personally want my driver to show emotion and PASSION and get a little bent out of shape occasionally when things don’t go his way. I don’t see people getting mad because Danica got out of her car later during the same race and wagged a finger at Reagan Smith- if anything people are saying that it was silly to do (just wag a finger). I don’t know, maybe I can understand being snarky and pissy when things aren’t or don’t go your way because I have a little bit of that in me too so I identify. For those specifically concerned about what children are going to take from the toss: I think if anything is a good time to open up a conversation about how Tony Stewart, while yes he can drive anything with wheels, is also a human being. He is just a regular ol’ human and sometimes regular ol’ human’s get upset when things don’t go their way. They do or say things that they wouldn’t do or say on a normal day. In other words, Tony Stewart isn’t PERFECT and like everyone else in the world he is going to make mistakes too. He already said that he doesn’t “enjoy getting mad.” It’s not something he does for fun (getting mad) or something that he does on a daily or even race day basis. It happened- he’s not perfect. That the important thing is to move on- not hold a grudge and not eat Ritz for the rest of your life. Honestly that kind of vindictive behavior is more concerning to me than the helmet throw because you are purposely trying to do harm to a person’s career. 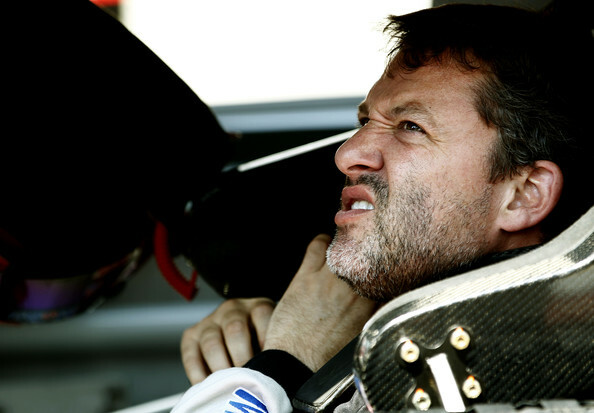 Is Tony Stewart a bad role model for throwing his helmet? I say no. He’s a human being with passion for his sport. He threw a helmet at a car- it’s not like he went back out onto the track in his car and hunted down Matt Kenseth and purposely wrecked him. NO HUMAN was in danger. I don’t see throwing your helmet (or a hans device or heel guards or gloves) as being such a dastardly deed. Seriously. I actually kind of really like what Greg Biffle had to say about the matter- read it for your self here (via Sporting News). Are you kidding me?! Tony tossing his helmet was THE highlight of the 2012 season… I mean I leapt up off the couch ran down the hall to gather the family to make sure they were watching this. Tony only did what every “real” Stewart fan was wanting to do from their living room… to them Kenseth had just ruined Stewarts night and he needed to be told what was what. It brings to mind an incident in Texas a few seasons ago when J. Burton wrecked my Jeff under caution. At that moment I wanted to beat the crap out of Burton and to get to see Jeff go after him was at least a small bit of satisfaction. Emotion is part of this sport and I want to see that from the drivers. I have no interest in watching robots! Over the course of the past 2 weeks I can’t tell you how many times I’ve seen replays of Tony’s helmet toss. About time some passion is shown. Just really wanted you to know that I always read your blog but rarely reply due to time constraints. Love it. And great work!!! Tonys the man! !